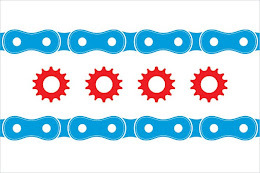 I'm fortunate that the Illinois Bicycle Law weblog has become a respected and reliable source of news and legal analysis about bicycle laws in Illinois. Naturally, the majority of feedback I get is from bicyclists inquiring about Illinois laws as they apply to bicyclists. However, every so often I get a critical inquiry that is something along the lines of "how come bicyclists don't have to follow the same laws as motorists?" "Traffic laws apply to persons riding bicycles. Every person riding a bicycle upon a highway shall be granted all of the rights and shall be subject to all of the duties applicable to the driver of a vehicle by the (Illinois Vehicle) Code." As such, bicyclists should not ride like they are immune from the law. If a rider is injured while riding, but they were breaking a traffic law at the same time, their chances for compensation will either be greatly restricted or altogether eliminated. Insurance companies and their attorneys will immediately seize upon any opportunity to argue that it was the injured bicyclist, not the motorist that caused a collision. Moreover, a police officer can give a bicyclist a ticket just as easily as he gives a motorist a ticket. After all, the same laws apply to both.